It’s the new year, and while it’s not quite spring cleaning yet, there’s no point lounging around (see what we did there?). If you are anything like us, you may be surveying your living room post-Christmas and wondering how it got so messy. Whether it’s the kids bits and pieces accumulating in a pile in the corner, or the sofas buried underneath cushions, there are ways to bring some order and tidy up your lounge. Before we talk about how some of our products can help you store and tidy up parts of your living room, let’s start with the basics. Is there stuff you simply don’t need to keep? It’s obvious, but we’re all guilty of ignoring this and failing to throw away “that lovely tin” (which we’re never going to use) or “that blanket is still usable” (it’s not, it was ripped by Aunty Marge on Boxing Day). Use this opportunity to find items that you don’t want any more, but other people may be desperate for, and then sell them on eBay. You get less clutter and make a bit of extra cash. So before you start looking for storage solutions for your living room, grab a bin liner and go round being as ruthless as you can bear to be. While you are decluttering, you can take the opportunity to start preparing for our big tidy up by separating out any items that you need to keep, but don’t want to store in the living room – this may be excess cushions or the third sofa throw that you do loved – you can also great a pile of items that really shouldn’t be in the living room in the first place, such as any children’s toys that belong in their bedroom. If there’s items you don’t need, but might still be useful for someone else, why not get together a charity shop bag? Now you know what you really have left to store and sort, we are here and ready to leap into action! Let’s start with your excess sort furnishings – these might be cushions or throws or similar. One of our heavy duty vacuum storage bags is perfect for keeping these items as they reduce the space required and protect them from getting dusty and dirty. For most purposes in the living room, our Extra Large Vacuum Storage Bags should suffice – you may want to use a Jumbo if you are looking to store a small rug, but the compression you are likely to get on one of these tends to be less, so our Jumbo Underbed Storage Bag is normally a better option for rugs. 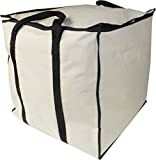 If you don’t have room to store things in other rooms or in a loft, take a look at one of our underbed storage bags – the Extra Large is a good one. You can fill these up, and then put them on their side behind your sofa as long as it backs up against a wall. This hides everything away and takes advantage of that deal space between the bottom of your sofa and the wall. For most people, the black bag rather than the beige will hide away and be almost invisible. For items that won’t benefit from being put in vacuum storage bags, but can be stored away in a spare bedroom or loft, take a look at our Versatile bag or Heavy Duty 100 Litre Storage Cube Bag. These can take heavy loads and be lifted, so they are perfect for putting things away in an attic. Now, for the remaining bits and pieces that have to stay in your living room, we recommend something like our Jumbo Heavy Duty Foldable Box. They are stylish and discreet, in matt black, and can be folded away when not in use, and they have a lid attached to hide away contents. If you need smaller boxes, they are available in Large, Medium and Small as well. You should end up with a decluttered and much tidier living room. Let us know how you get on with your project!